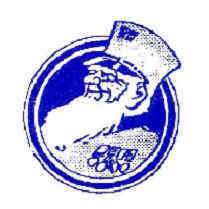 Like most teams Chelsea have changed their badge numerous times in their history, the first one shown below features an image of a Chelsea Pensioner, who of course Chelsea got their nickname from. They kept this badge till 1952 when following the arrival of Ted Drake as manager he instigated a move away from the old “Pensioners” tag, in the interim period while the badge was being designed they used a mix of the clubs initials in a white shield. The next badge is probably the one most associated with Chelsea and was inspired by the Metropolitan Borough of Chelsea civic coat of arms. The main part of the badge, the lion, is taken from the Arms of Earl Cadogan who was the president of the club. The Abbot the lion is holding is derived from the Abbot of Westminster whose jurisdiction Chelsea fell under. The Roses are representative of England whilst the football are self-explanatory!! 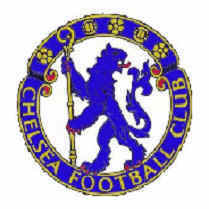 A simplified version of this badge was the first Chelsea used on their playing shirts in 1960. 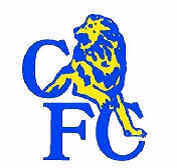 However in 1986 Chelsea decided to design a new badge to maximise the potential of the growing football merchandise market and a design featuring the lion and CFC was decided upon, this was used for almost 19 years. In the early 2000s Chelsea were pressed to return to the more classic Chelsea badge and the design below was launched in November 2004. 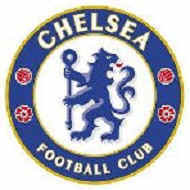 The question is of course will this be the last ever Chelsea badge or will another be introduced in another 19 years !! There are a few football clubs around whose fans form a sort of allegiance with other football clubs fans, in truth though these are fairly rare. However in the case of Chelsea, Rangers and to a certain extent Linfield there is a very strong allegiance between the three sets of fans which has grown to be known as “The Blues Brothers”. There are numerous theories why this is the case, some believe its down to the simple fact that they all wear blue, a bit too simplistic explanation realy !! Others put forward the Loyalist sectarianism connection between the three sets of fans as being the common denominator and the reason why the allegiance was formed. Apparently there is also a theory that when Chelsea were founded they used Rangers tops provided by two brothers from Glasgow !! A more modern day explanation which has strong support is the fact that in 1985 Rangers travelled down to London to play Chelsea in aid of the Bradford City fire appeal fund. At the game the feared violence between the two fairly active sets of hooligans never materialised and in fact both sets of fans applauded each other as a gesture for supporting the appeal. No matter what the true reason the fact remains that this allegiance has created another area of interest for football badge collectors with numerous badge designs being created highlighting the connections. No doubt the biggest majority of these badges are centred around the Chelsea Rangers connection but there are also a few designs where the three are all together. 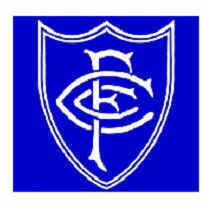 Below is just a small example of the hundreds of "Blues Brothers" football badges available. 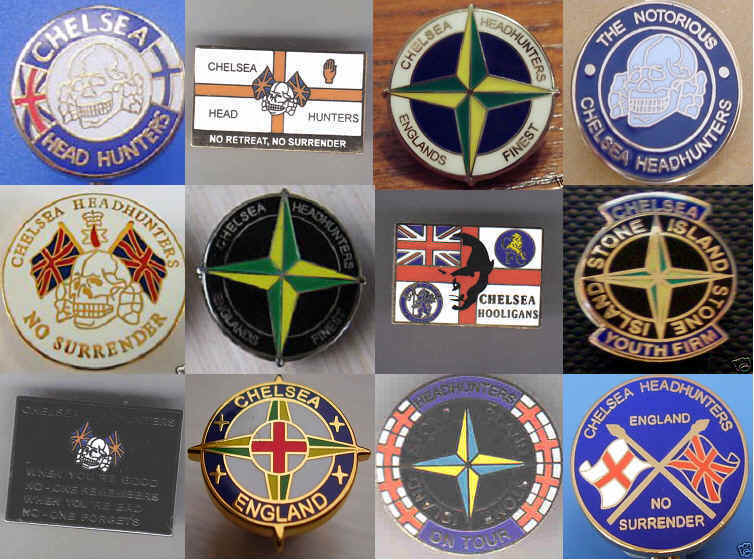 Although most football clubs have (or had) their own hooligan following there were always a few teams whose "firms" were more active than others, one of the more high profile ones being Chelseas "Head-hunters"
Obviously this "fame" led to a multitude of different football badges being designed featuring the Head-hunters and associated emblems, i.e., the skull and the Stone Island emblem. Of course no self respecting hooligan would be seen dead wearing one of these but it did create yet another area of memorabilia for football badge collectors to explore and expand their badge collection into. The more selective football badge collectors would be as reluctant to collect these as would be the actual hooligans to wear them but for some collectors absolutely anything with the clubs name on is fair game hence the massive market for these particular football badges. We have shown below just a small selection of the hundreds of designs available in this particular football badge genre.